So in celebration of my nephew being born I am releasing my latest pattern! When that vote came in I was pretty happy, it was good timing, and kinda has kicked me into gear to get some things done! Knit up this cozy and unusual recieving blanket for the newest little one in your family. It’s sure to take its place among the special and cherished textiles in your collection. Use the pattern on a larger loom and knit yourself up a rag rug! Or knit it up on a smaller gauge loom and make a hot pad or placemat. 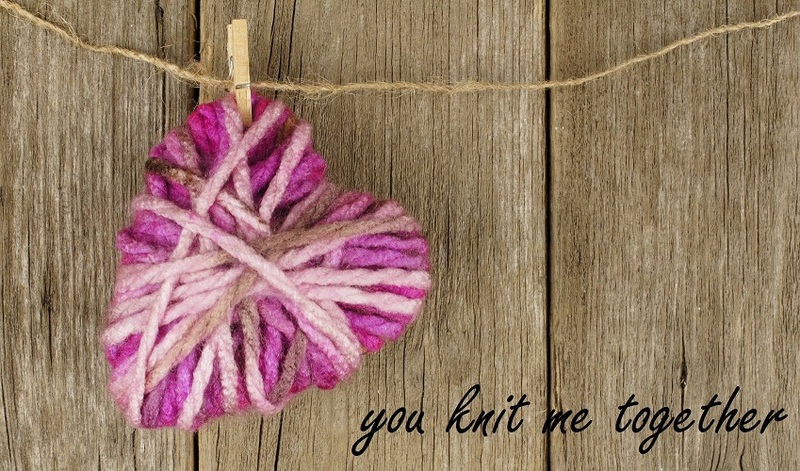 This versitile pattern is a great way to stretch your skills and knit in new directions! Optional: crochet hook for cable cast on, knitting needles for kitchener stitch. This entry was posted in Knitting Without Needles, Patterns, Patterns for Sale and tagged Knitting Without Needles by Denise. Bookmark the permalink. This is a beautiful blanket and was fun to do. This is great. I love it. It reminds me of the peppermint candies. I wanted to see baby pictures…wahhh. 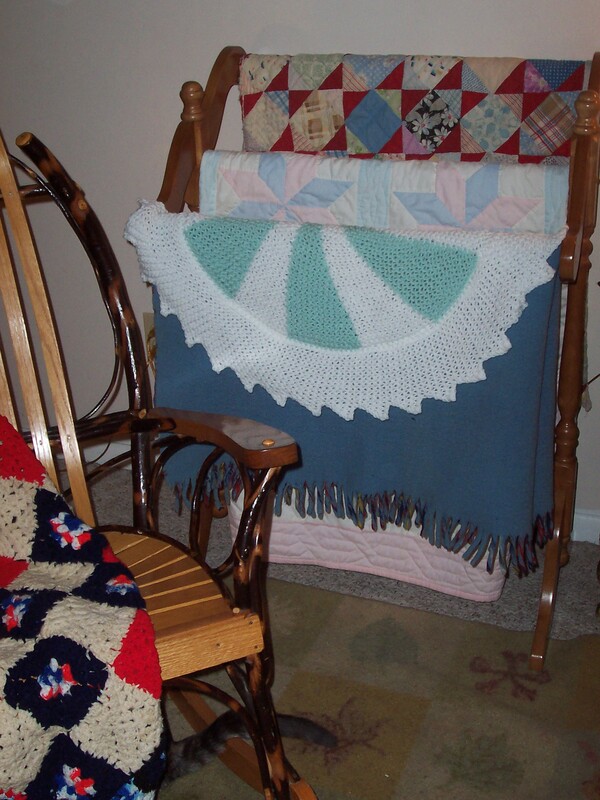 I love the rack for the baby blanket. Pingback: Knitting Without Needles » Blog Archive » Bias Baby Burp Cloth! 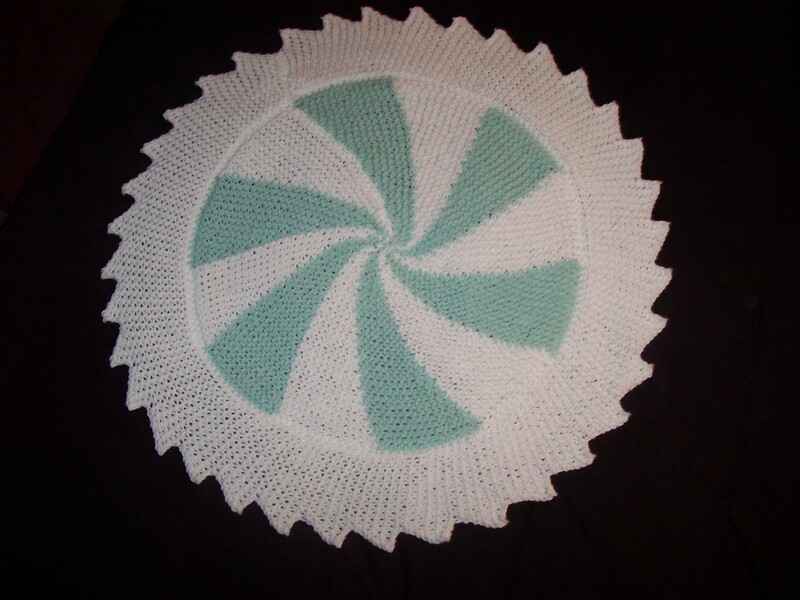 how long does it usually take to make a pin wheel baby blanket with a loom. I ordered this patter last Tuesday, bought yarn and loom on the way home from work. It’s Sunday and I’ve just backed it with candy cane material to make it a pillow cover. You can see it at my Flickr page http://www.flickr.com/photos/ellenceleste/4086187571/. Thanks for designing such a terrific pattern. Absolutely beautiful. . . just love it! An infection No More addresses all of them and extra. coping with instantly, corresponding to ache, itching, older, discharge, and extra. available for anybody who has common yeast infections. I live in Scotland and have returned to knitting after a long time and I am loving this pinwheel pattern I do lots of knitting but just read this is knitted on a loom or rake pegs which I have never heard of. Can this be done on needles only.